Thanks to everyone who helped save nearly 8 tonnes of CO2 over the May Bank Holiday Weekend by reducing combined electricity consumption on the North and South Bank by nearly 17,000 kWh (1). The split in recorded energy savings was almost exactly 50/50 between the North and South bank. 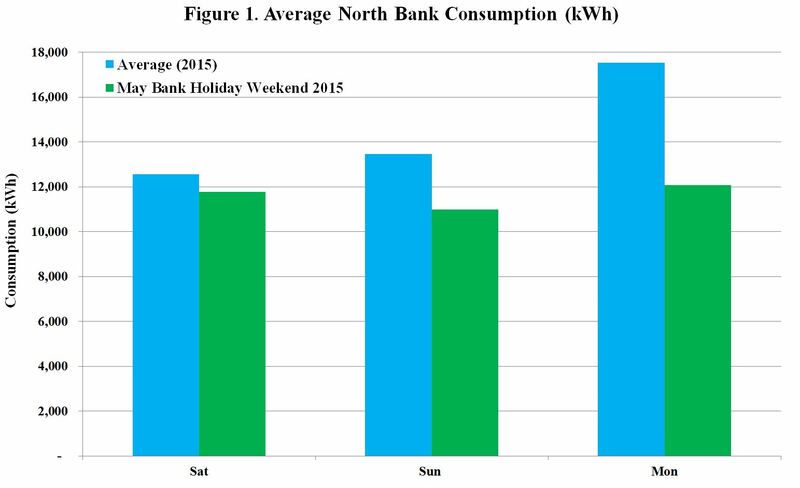 A massive 20% reduction in electricity consumption was recorded on the North Bank over the course of the weekend (see Figure 1) and a very respectable 6.6% reduction in electricity consumption was recorded on the South Bank (see Figure 2). Savings were made each day on the North Campus (see Figure 1). 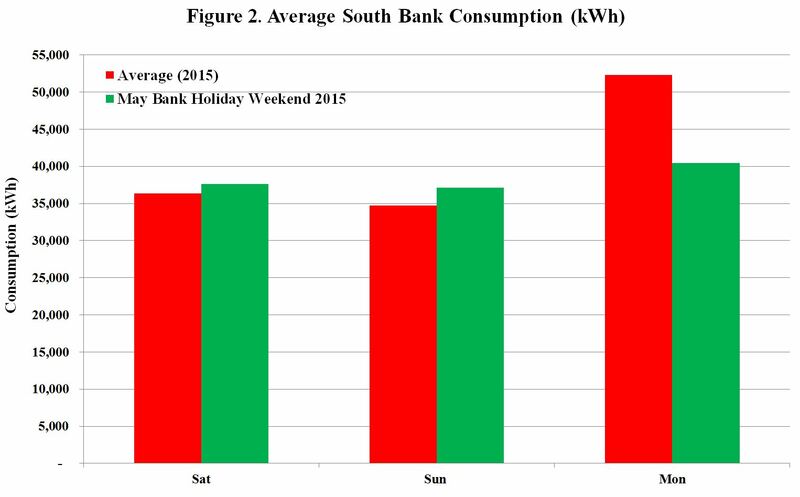 However slightly above average increases in electricity consumption were observed on the South Campus for both the Saturday and Sunday. Notwithstanding the savings made on Monday (23%) meant average savings on the South Bank over the entire weekend amounted to 6.6%. Whilst statistical significance at a 95% level cannot be attached to the results they still represent significant savings both in terms of avoided CO2 emissions and reduced electricity consumption. Bearing in mind that all public sector bodies are required to reduce their energy consumption by 33% by 2020 this is great news. (1) According to the Sustainable Energy Authority of Ireland (2014) the most recent figure for the CO2 intensity of electricity production is 469 g CO2/kWh. Therefore 17,000 kWh x 469 g CO2/kWh = 7,973,000 g CO2 or ( 7,973,000/1,000,000) = 7.973 tonnes of CO2. (2) Under Ireland’s first National Energy Efficiency Action Plan published in 2009 and subsequent plans published in 2011 and 2014 public bodies are obliged to reduce their total primary energy requirement by 33% by 2020 (Department of Communications Energy and Natural Resources (DCENR) 2009; DCENR 2011; DCENR 2014). Sustainable Energy Authority of Ireland (2014) ‘Ireland’s Energy Consumption and Related Emissions Fell in 2013’ [online], available: http://www.seai.ie/News_Events/Press_Releases/2014/Energy-in-Ireland-2014-release.pdf [accessed 5th May 2015]. DCENR (2014) National Energy Efficiency Action Plan 2014 [online] available: http://www.dcenr.gov.ie/NR/rdonlyres/20F27340-A720-492C-8340-6E3E4B7DE85D/0/DCENRNEEAP2014publishedversion.pdf [Accessed 27 Jan 2015]. DCENR (2011) Ireland’s second National Energy Efficiency Action Plan to 2020 [online] available: http://www.dcenr.gov.ie/NR/rdonlyres/B18E125F-66B1-4715-9B72-70F0284AEE42/0/2013_0206_NEEAP_PublishedversionforWeb.pdf [Accessed 27 Jan 2015]. DCENR (2009) Maximising Ireland’s energy efficiency: The National Energy Efficiency Action Plan 2009-2020 [online] available: http://www.dcenr.gov.ie/NR/rdonlyres/FC3D76AF-7FF1-483F-81CD-52DCB0C73097/0/NEEAP_full_launch_report.pdf [Accessed 27 Jan 2015].